Dow Theory considers daily action in the stock market to be nothing more than noise, and that presupposition may be gaining in importance. I’ve been hanging on to the chart below, waiting for an opportune time to present it, and I think that time is now. 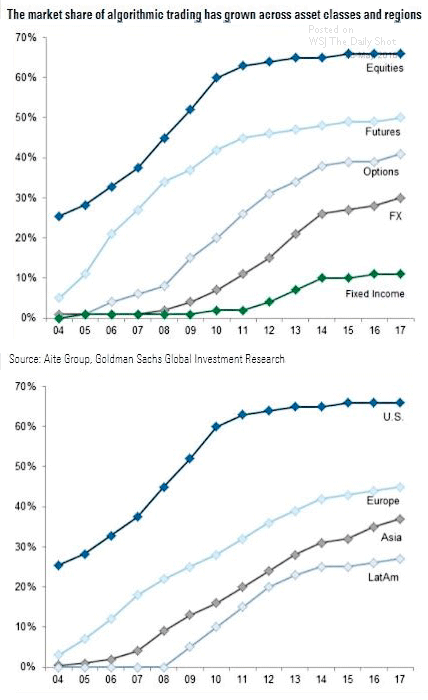 This chart, using data from Aite Group and Goldman Sachs, claims to show the share of trading that is done by algorithms. As you can see, the majority of equity market trades (around 65%) are executed by computers based on preset logic. We can also see in the bottom chart that algorithmic trading plays a more dominant role in the U.S. than in other markets. So what does this mean for investors? In short, it means a lot more noise in the market, and a lot more garbage being priced into stocks. Here’s an example. Yin Luo, of Wolfe Research, was a former star quant at Deutsche Bank, and a longtime proponent of artificial intelligence. He’s big on trying to use machine learning to provide an edge for investors. We have an algorithm that goes through every major media and social-media site, looking for keywords related to trade conflict, like ‘trade tensions,’ ‘tariffs’ and ‘quotas.’ It’s gauging the wisdom of crowds. Once people are talking about it, it is more relevant to stock performance. Today, [that chatter] is at its highest point since we started tracking these things in 2003. I don’t want to knock artificial intelligence at all, because frankly, we’re seeing some amazing things in a variety of fields like medicine and self-driving cars, but when it comes to markets, many of these “algos” are doing nothing more than injecting noise into an already noisy environment. They are geared to trade instantaneously off of headlines and sentiment changes – as reflected by our collective “voice” in the cloud. While some of these may successfully generate short-term profits for their owners, they do absolutely nothing from a long-term perspective, except convolute the situation with misguided signals. Do you think those algos know how to factor in all the possible ramifications and outcomes of a trade war? No. They’re simply looking for a shift in sentiment, and trading it. That’s fine if your investment time horizon is a few hours or days, but for us long-term investors this is nothing but (yes, I’m going to say it again) noise. Tomorrow, if there happens to be a different set of headlines and a different “global conversation,” these algos might buy, and that would drive the market higher. The following day, another presidential tweet might send the algos scurrying for cover, leaving a trail of red across the board. In sum, many of these algorithmic trades are exacerbating short-term market moves. As one algorithm reads headlines and executes sell orders based on sentiment shifts, it triggers another algorithm – one that simply utilizes short-term trend following – and so on. Now that I’ve ragged on these algos I’d like to make something exceptionally clear: I am a huge fan and a big proponent of using a data-driven approach to investing. As someone who has studied a lot of psychology in both the educational and market settings, I can tell you that most of us are downright irrational and have no business injecting our opinions into our investment decisions. BUT – when I emphasize a reliance on data, I’m talking about a long-term approach to investing, not the short-term nonsense that many of these quants come up with. Utilizing economic and financial market data to drive long-term investment decisions is not only a good idea, it’s downright critical. But that’s not what the vast majority of these algorithms do. Instead, they try to capitalize on fleeting market moves and changes in sentiment that can be reversed literally within minutes. The end result is a market pushed around from one day to the next by machines that have no objective (nor understanding of the broader environment) other than to generate short-term profits. Moving on, let’s take a look at some of the macro data that does impact the long-term performance of stocks, but most likely doesn’t play any role in the quick-draw, shoot-from-the-hip algos that push our markets around on a daily basis. First up is a chart of the Markit Composite PMI (Purchasing Managers' Index). Recall that Markit puts out two main U.S. PMI indexes, one for manufacturing and one for services. The manufacturing PMI recently came in a 54.6, with the services PMI at 56.8 (anything above 50 represents expansion, with figures greater than 55 considered very strong). These two indexes are reflected in the Composite PMI dataset which is shown below. The upward trend here remains evident, and that reflects positively on the outlook for U.S. GDP. Markit summarizes the latest survey data saying, “The latest survey revealed intense pressure on manufacturing supply chains, with delivery times for inputs lengthening to the greatest extent since the index began in May 2007.” Pressure on supply chains is a result of strong demand – a good thing. 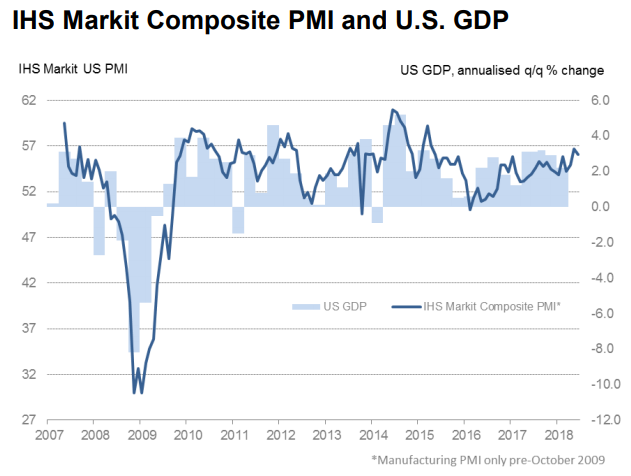 Referring to the last Composite PMI reading, they add, “The latest reading signaled that private sector output continued to expand at one of the fastest rates seen over the past three years.” Pretty sure that’s a good thing too. As for leading indicators, those continued to expand as well, though not quite as fast in May as in the prior two months. Data released last week from The Conference Board showed their LEI rising 0.2% in May, following a 0.4% rise in both April and March. 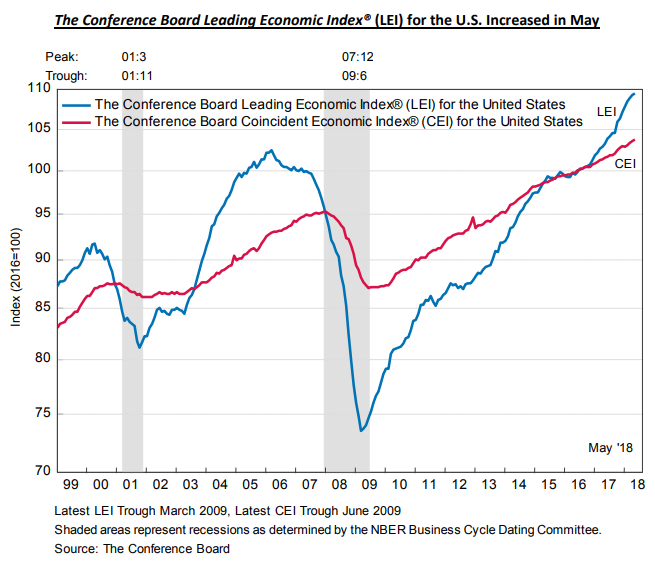 As I’m sure you’re aware, The Conference Board’s LEI has a good track record of turning down well before an approaching recession, so the fact that growth moderated slightly last month is not a big issue. 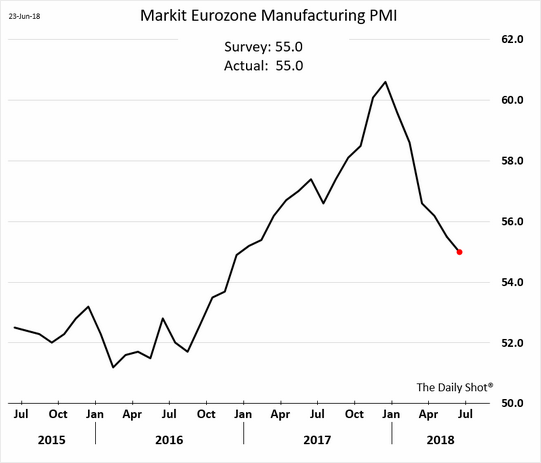 I don’t have time to discuss the status of all of our trading partners, but I would like to quickly show PMI data for Europe, as we’ve heard a lot of commentaries lately about deteriorating conditions there. 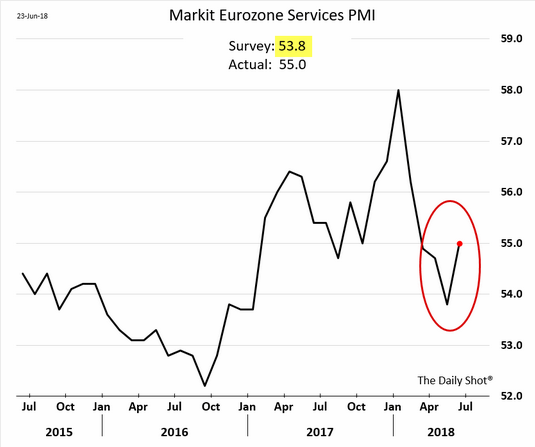 The two charts below (courtesy of The Daily Shot) show Eurozone manufacturing and services PMI data. While the recent deterioration is evident, take note that both figures remain in strong expansion territory (55.0 for both manufacturing and services). As I’ve commented a number of times, it may be difficult to get a real trend going until we begin to see some type of resolution, as opposed to escalation, of the trade war talk. Until then, we’ll glean what we can from price action but rely more heavily on the underlying fundamental economic data, which will ultimately illuminate the future path of corporate profits.